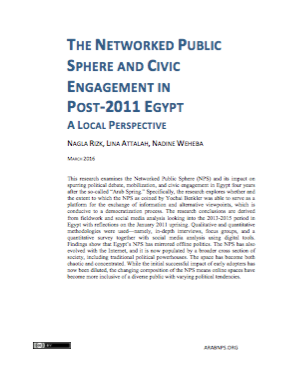 This research examines the Networked Public Sphere (NPS) and its impact on spurring political debate, mobilization, and civic engagement in Egypt four years after the so-called “Arab Spring.” Specifically, the research explores whether and the extent to which the NPS as coined by Yochai Benkler was able to serve as a platform for the exchange of information and alternative viewpoints, which is conducive to a democratization process. The research conclusions are derived from fieldwork and social media analysis looking into the 2013-2015 period in Egypt with reflections on the January 2011 uprising. Qualitative and quantitative methodologies were used—namely, in-depth interviews, focus groups, and a quantitative survey together with social media analysis using digital tools. Findings show that Egypt’s NPS has mirrored offline politics. The NPS has also evolved with the Internet, and it is now populated by a broader cross section of society, including traditional political powerhouses. The space has become both chaotic and concentrated. While the initial successful impact of early adopters has now been diluted, the changing composition of the NPS means online spaces have become more inclusive of a diverse public with varying political tendencies.